James Joyce discarded Catholicism, but he religiously observed Groundhog Day. February 2 was his birthday, and Joyce took his birthday seriously throughout his adult life. He didn’t look for the groundhog’s shadow, however. He looked for his own, and believed he’d found it in the person of another, lesser-known Irish writer who he came to consider his spiritual twin. Joyce claimed the other man had also been born on Groundhog Day in Dublin in 1882, just like him, though scholars have been unable to verify the exact birthdate of this other, lesser-known scribe. Little of the other man’s biography is in fact known with certainty. The man may have been two years old when his father died and possibly six when he entered a Dublin orphanage, never to return home. It’s all a bit unclear; a fog of rumor hangs over his origins as it does over John Henry or Jesus Christ. This much is known: he was very small as a child; when he grew up he was still so short that one journalist said he was no taller standing than sitting; others called him a leprechaun, and he didn’t much like that; he told a cartoonist, “Eh, you want to caricature me, eh? Well, the Almighty beat you to it.” This too is known: notwithstanding his diminutive beginnings, great men would come to worship at his feet. The Irish playwright Seán O’Casey called him “the jesting poet with a radiant star in his coxcomb.” Eugene O’Neill asked him to name his children and so Oona and Shane O’Neill got their names. James Joyce asked him to complete Finnegans Wake should Joyce himself go blind. He published plays, novels, stories, and poems, including a series of them in The New Yorker in 1929, and his voice once pervaded the Irish airwaves like rainbows south of Skibbereen. 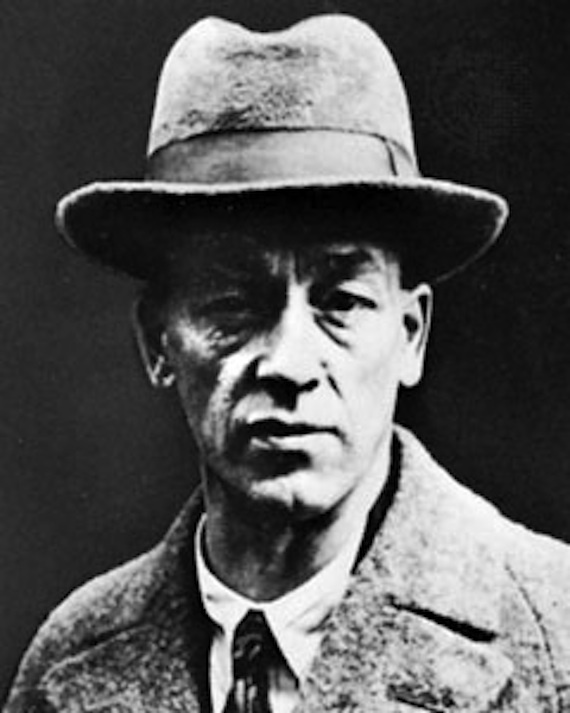 This so-called leprechaun with a voice “nimble as a goat’s foot,” as one commentator puts it, was called James Stephens. Some evidence suggests Stephens was born not on February 2, 1882 like Joyce, but rather on February 9, 1880. Perhaps Joyce asserted they were twins because he regarded Stephens as a particularly worthy rival, and because Joyce conquered his rivals by appropriating them — and because, after being enemies, they became good friends. In a letter dated May 31, 1927, Joyce reports that for years he carried three portraits in his pocket: one of his father, one of himself, and one of James Stephens. When Ulysses was published on February 2, 1922 — on Joyce’s 40th birthday, by his own design — he inscribed a copy to his poetical twin. Stephens in turn wrote a theosophical poem called “Sarasvati” for Joyce’s birthday and for the rest of Joyce’s life gave him the kind of respect that Joyce demanded of every animal, mineral, and vegetable. Stephens called Joyce a king, encouraged him to carry on with Finnegans Wake, and when it was published, told Joyce that its last chapter was the “greatest prose ever written by a man” — praise that deeply moved Joyce, and with which he surely concurred. He turned his chin and his specs at me, and away down at me, and confided the secret to me that he had read my two books; that, grammatically, I did not know the difference between a semi-colon and a colon: that my knowledge of Irish life was non-Catholic and, so, non-existent, and that I should give up writing and take to a good job like shoe-shining as a more promising profession. I confided back to him that I had never read a word of his, and that, if Heaven preserved me to my protective wits, I never would read a word of his, unless I was asked to destructively review it. Stephens had had the upper hand in 1912, but by 1946 Joyce had thoroughly overshadowed his old rival. The word “non-existent” in the foregoing passage calls out the name of another of Stephens’s wounds, a possible turning point in the Stephens-Joyce rivalry. It was in a 1915 essay in The New Age entitled “The Non-Existence of Ireland” that Joyce’s influential champion Ezra Pound dismissed Stephens as “a mild enough writer.” It enraged Stephens, who wrote a bitterly funny letter to The New Age deriding Pound in doggerel form. Stephens concludes that having written Pound’s name, he had to go “fumigate” his sullied pen. Could it be that the shabby, out-of-print volumes that keep custody of Stephens’s legacy are, as McCord argues, “vintage wine in a rain barrel?” Could it be that underneath a homely title like Irish Fairy Tales, which Padraic Colum notes was “never sufficiently praised” and which is now mislabelled as children’s literature, there lies a work of true genius? I became the king of the salmon, and, with my multitudes, I ranged on the tides of the world. Green and purple distances were under me: green and gold the sunlit regions above. In these latitudes I moved through a world of amber, myself amber and gold; in those others, in a sparkle of lucent blue, I curved, lit like a living jewel: and in these again, through dusks of ebony all mazed with silver, I shot and shone, the wonder of the sea. No wonder no one ever wrote Stephens a fitting epitaph; no one could say it quite as well as him! But perhaps what Stephens wrote of the king of the salmon is good enough for himself. He is brave, skilled, honorable, and as unconcerned with either fame or revenge as his hero Fionn. ‘How long have you been here?’ was the next query. ‘Seven years’ the poet answered. ‘It is a long time,’ said wondering Fionn. ‘I would wait twice as long for a poem,’ said the inveterate bard. Retiring into Joyce’s shadow, Stephens remarked that Finnegans Wake is both “unreadable” and “wonderful.” His own works are readable and wonderful. Groundhog Day seems a fitting time for Stephens to step back out into the light after a long winter of oblivion in Joyce’s shadow. Or, if that’s not to be just now, later then. However long it takes. Stephens would wait twice as long for a poem. Austin Ratner is author of the novels In the Land of the Living and The Jump Artist, winner of the Sami Rohr Prize. His non-fiction has appeared in The New York Times Magazine and The Wall Street Journal, and his short fiction has been honored with the Missouri Review Editors’ Prize. Visit his blog on the classics at austinratner.com. Stephens is probably most read today for his The Insurrection in Dublin, his eye witness account of the Easter Rising. It is not a political book – it is a well observed, fascinating account. It should be read by anyone interested in either Stephens or the Rising. There is something incredibly moving and exciting about reclaiming a lost piece of history, reviving a lost voice. This piece serves as a resurrection, and as reassurance to artists that their work and their words can have meaning and effect beyond their own time. Thanks very much for the revival of a great Irish author. I was unaware of Stephens’ The Insurrection in Dublin, which I look forward to reading as we approach the centenary. Splendid article– what a picture you’ve made of this man and his work. Gorgeous quotes! Only know Stephens from the beautiful folk-y albums Bill Crofut made with poems by Stephens and others, including Shakespeare, Blake, Yeats, Reid (and even Joyce). So forgive this digression– if it is indeed a digression–but I’d like to make a case for less of a distinction between what constitutes children’s literature and well, literature. I’m going on instinct here, but maybe this habit that has a lot to do with why work like Irish Fairy Tales gets overlooked. Perhaps not coincidentally, the Crofut albums are children’s records that I found when my kids were babies. But they mean as much to me now as they did then, and I’m as likely to listen to them side by side with “grown up” music, just as I might pick up Travers or Sendak after reading Rankine or Chaucer.